When I see any of the above actions in a piece of prose, alarm bells start ringing. The problem in a nutshell? The protagonist has been left alone. I’ve been having a recent discussion with one of my authors concerning the Single Character Scene. 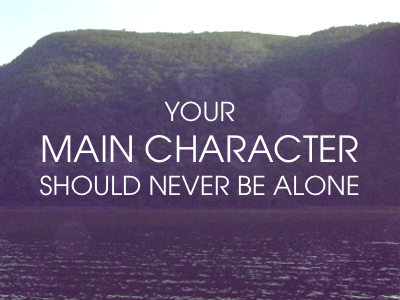 His protagonist is a solitary, loner type who grows as she faces challenges and overcomes them. So far, so good, and she’s actually a great character once you get to know her. But once in a while, the action lags and my author has trouble getting things moving with interesting, vibrant scenes to sustain her character and conflicts. As a default guideline, I’ve suggested to him that he avoid her being alone wherever possible. The problem when she’s alone is that nothing happens. Her thinking about her troubles is not action or interaction, and despite it having the veneer of conflict, it’s still actually thinking, rather than doing. The best way to show your character to the reader, to give us their deepest, innermost vulnerabilities, their strengths and weaknesses, their hopes and fears, is to have them interact with other characters (in particular, ones who are very different from them so everybody’s individual traits are more easily emphasised). Interacting gives us the best chance to see how they relate to the world, and especially to challenges and conflicts. these are usually moments where the character is not doing anything particularly exciting to watch, so you are relying on their thoughts to carry the moment. It most likely will not. Want to show us someone being afraid? Don’t have them quaking on their sofa. Put them in front of their worst enemy and let the terror rise! Want to show us someone being angry? Don’t have them gritting their teeth while having a session on the treadmill. Put them in front of their best friend and let the sparks fly! Want to show us someone being heartbroken? Don’t have them drinking wine in front of a DVD. Put them in front of the most embarrassing person they could meet at that moment, and let the humiliation run riot! Want to show us someone stressed about money? Don’t have them checking their bank balance. Put them in front of the car they long to buy, the precious heirloom they have to sell. Evict them from their home! Burn it to the ground! What’s the common factor in all these situations? Conflict. There is still conflict. Conflict always remains the central essence brimming over. If there are obstacles to overcome, then the character is doing something. In none of these examples is the protagonist sitting thinking, contemplating the deeper meaning of life. They are either attempting their escape, or fighting for survival, whether of the body or the soul. Conflict doesn’t just exist between characters—it also lies between a character and the universe. Where survival is at risk, we see the character facing obstacles and overcoming challenges. Remember, literature is not the same as real life. If we were stranded on a desert island like Robinson Crusoe, then sure, we’d no doubt spend a lot of time sitting on the beach, staring out to sea in a hazy cocktail of loneliness, peace, fear and regret. But stories aren’t about being static, or sitting and staring. Stories are about events, struggles, decisions, changes. As a final thought, look at Harry Potter. A lonely figure, I’m sure you would agree. Lonely, yes, but is he ever alone? Rarely. If you think about how isolated and troubled he feels – it certainly isn’t because he spends time on his own. It’s because he misses his parents, because despite being surrounded by friends, he alone has the shadow of Voldemort hanging over him. Now go and make your character feel lonely. Without them being alone! Excellent reminder (or in my case first indication) of this issue.